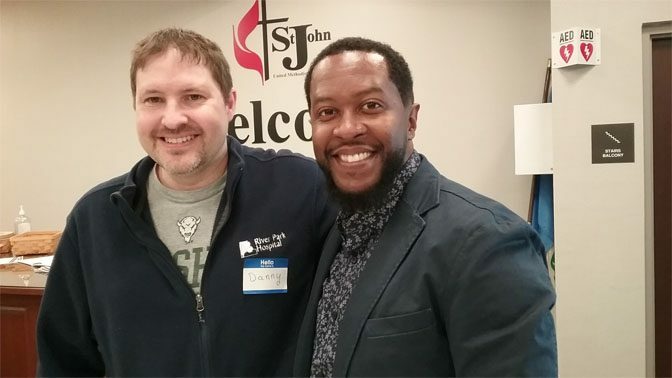 Christopher Brooks, a motivational speaker, and a native of Charleston, West Virginia presented the keynote talk at the West Virginia Counseling Association’s Spring 2019 Conference. 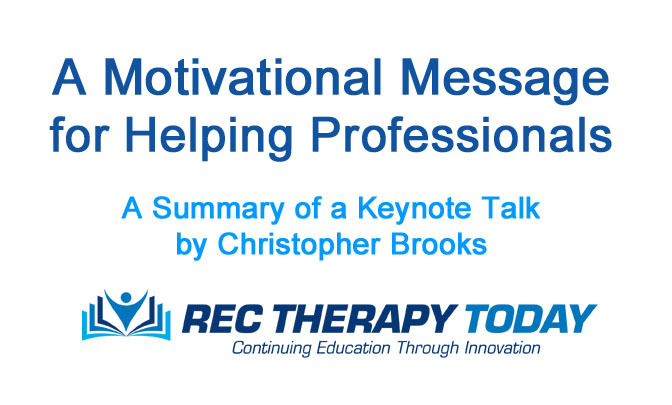 Brooks provided motivational messages for professional counselors to be their best. This can be applied by recreational therapists too. Brooks, who was previously in the military provided tips on helping the military learn to bounce back from Post-Traumatic Stress Disorder (PTSD). Christopher Brooks can be booked for motivational and keynote talks. Visit his site here: https://speakerhub.com/speaker/christopher-brooks. His book, Motivational Moments can be purchased from our Rec Therapy Today – amazon affiliate link here: https://amzn.to/2UVuAiN. Brooks brought his nieces pink stress ball. He bounced it. He shared that resiliency is the ability to bounce back like the ball. The opposite of resiliency is unable to bounce back like an egg. It would splatter. Soldiers with Post-traumatic Stress Disorder (PTDS) suffer many problems. These could include: flashbacks, intense reactions, inability to sleep, and nightmares. Brooks three (3) main principles for resiliency included: a.) Hunting the good; b.) Finding Icebergs, and c.) Goal setting. These three principles will be briefly summarized below. I am statements. Say aloud to yourself in a mirror: I am good enough. I am worthy. Positive self-talk messages: I am able to deal with this. I can cope with this. Gratitude: write down three to five things to be glad about in a journal every day to help get in the practice of focusing on the good in life. It is a great way to develop positive emotions. Take personal responsibility for your own emotional health and wellness. Balance: Brooks suggested having success in one area of your life and not others can cause problems. Get help and improve: relationships, career, finances, physical health, and emotional health. Brooks tips listed above are great tips for helping professionals like counselors and recreational therapists to develop a positive and healthy mindset. These suggests are preemptive ways to become prepared in case a trauma happens in your own life. We, helping professionals must be prepared so we can be our best to provide help and services for those people in our own care. Icebergs have two parts. Surface of the icebergs are visible and seen. There is a much larger part of the iceberg that is submerged under the water and is invisible. Brooks discussed the importance of treating the underlying issues that are not seen. Brooks used the analogy of weeds in a garden. Weeds can be seen above the surface. They can be picked, but they will continue to come back unless the root cause of the problem (what is under the ground) is dealt with. He discussed how there are there are chemicals that can reach down to the root and stop the weeds from growing back daily. Self-awareness of root issues is important. Changes are not made from the surface. Changes must be made at the root where stuff inside a person are. People with PTSD have triggers. Sounds, smells, sights, tastes may indirectly remind a person of a past trauma and bring about negative emotions. Becoming aware of these root issues is important. People can’t be trusted; people are evil. I’m not smart enough, etc. These types of thoughts create negative emotions. People do not overreact over one thing. Brooks suggested that the people who overreact have already had a lot of stuff building up. It was not just one thing. Finding icebergs requires a person to discover what caused them to feel this way. This could be for anyone with trauma, not just the military, but civilians. Counselors or recreational therapists may have experienced trauma and have their own icebergs to discover. Everyone has problems and issues. It is important for counselors and recreational therapists to be the best they can be so they can provide the best to people who they provide services. People like Veterans need quality care to help them with issues like PTSD. It is vital for counselors and recreational therapists to show up with the right positive energy and mindset. Brooks gave the analogy of a cookout. Everyone prepares something. Some people stay up all night baking or cooking. Someone brings potato salad. Someone made ribs. Someone brings ice. Other people who stayed up all night baking might look down on the person who brought ice as taking the easy path. However, the person who brought ice is just as important. Imagine how nice it is to have a cold beverage on a hot day. Be grateful for the person who brought ice. Your role as a counselor or a recreational therapist is vital. You have an important responsibility to help other people. You must show up and provide the best you can. Goal setting was discussed during the second part of this keynote talk. Vision is about picturing where you want to be. Brooks had a vision of becoming a motivational speaker and going on a book tour. Brooks suggested visioning reaching your goal and feeling the feeling of joy and satisfaction. Action is necessary. His wife reminded him that he had to write the book first. Action is the bridge that takes you from where you are now to where you want to be. Brooks provided an image of a map and a compass. Brooks discussed the importance of the person with the compass in the military. A small deviation could result in being in a dangerous zone. Practicing takes time. Brooks explained how he started small by speaking at toastmasters. Books discussed the process of David and Goliath as an example of taking steps. A bear tried to get David’s sheep and he fought the bear. A tiger tried to get his sheep and he fought the tiger. When Goliath showed up, David was ready for the next step became he started small and prepared. By this time, David was confident. It is important to make steady improvement towards your goal. Brooks started off small, trying to get a one minute of motivation message on the radio. He was rejected and rejected by people in the radio industry. His mentor gave a name and number. Brooks called the person who was excited about the radio idea, but invited him to show up the next day to do a 30-minute television program. Brooks was prepared when his moment arrived. Goals give people meaning in life. It is why we are here. Some people have a job. They may even excel at their job. Their job provides them with income. Other people have a career. They are doing the work they are passionate about. Set goals. Be the best you can be. People who you provide services for are depending on it.